Help your children “Defeat Monster Mouth”!! February is National Children’s Dental Health Month, and the American Dental Association is asking people to “Defeat Monster Mouth.” At GPS Dental, we strive to work with our little patients and educate them and their families by offering dental health services for all ages. National Children’s Dental Health Month is an annual month-long health focus that brings together teachers, dental professionals and health care providers to work with children and their caregivers to promote the benefits of good oral health. Offering dental health services and helping children develop healthy dental habits at an early age are important to Dr. Gary Skrobanek. Visiting GPS Dental for regular dental appointments will help get them started down the path for a lifetime of healthy teeth and gums. We wanted to highlight this year’s ADA slogan, “Defeat Monster Mouth” because it can help children make an association with keeping their mouth, teeth and gums healthy. We’ve included one of the posters that feature the McGrinn Twins, Flossy and Buck, Den Smiley and K-9, the dog. They are fighting to defeat “Plaqster the Monster” to win the battle of good oral health! 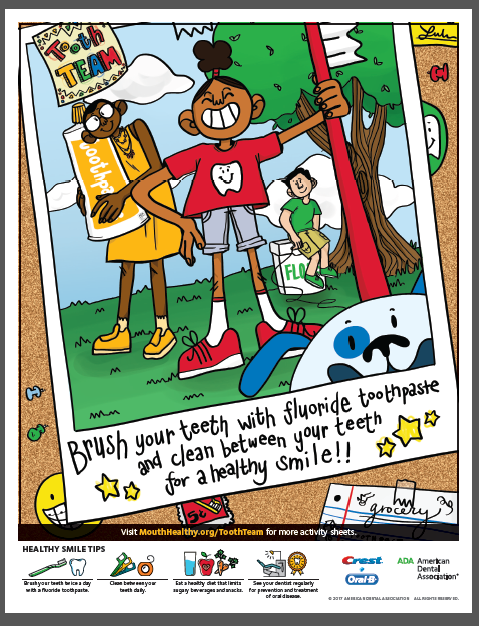 Notice that the poster demonstrates effective ways to defeat monster mouth and maintain good oral health by brushing and flossing! Even though everyone knows that brushing your teeth is a key component of their overall dental health. But, some are not aware of the correct way to brush their teeth. Be thorough and make sure to tilt your toothbrush a 45-degree angle to clean both the inner and outer surfaces of your teeth, as well as the chewing surfaces. Brush your tongue, it’s important to your overall oral hygiene and will help keep your breath fresh. Pro Tip: Sometimes setting a timer or playing a favorite song or video that lasts at least two minutes is an easy way to get this young habit started! Make sure you’re cleaning between your teeth each day; otherwise, you’re not cleaning 40% of your teeth’s surfaces. Bedtime is usually the best time to floss, so you can make sure all those food particles have been cleared away from those hard to reach places and don’t start to leave decay. Have you heard that it’s better for the enamel on your teeth to spit your toothpaste out after you brush, but not rinse your mouth with water? Why? Because rinsing your mouth will wash away your toothpaste’s protective fluoride that you want to leave behind when you brush your teeth, so it continues to be effective. Not only does it strengthen the enamel on your teeth, it also reduces the amount of acid that the bacteria on your teeth produce. This will help reduce cavities. Pick healthy snacks, like fruits and veggies. Steer clear of those sugary treats and remember that the worst culprits are the chewy, sour / sweet candies that kids love. Remember to visit Dr. Skrobanek at GPS Dental twice each year for your oral exam and cleaning! Our dental health services for children include X-rays, professional cleanings, dental sealants, and treatment for cavities. Now you can understand why the expert team at GPS Dental is so focused on the dental health services they offer and helping their little patients develop healthy dental habits. We want kiddos to have a lifetime of healthy teeth and gums!